I was invited to Sunday Lunch at the Edwardian Tearooms by the Birmingham Museum and Art Gallery. The Birmingham Museum and Art Gallery is one of the city’s most iconic landmarks. Most people who grew up in the local area will have visited at least once as a child, and it’s definitely a must-see for anyone visiting the city. I’ve been there many times over the years, but had never visited their Edwardian Tearooms. I had heard that it is a great place to have breakfast, and that they do a really good afternoon tea, but I’d never actually eaten there. So when they asked me if I’d like to try the Sunday Lunch at the Tearooms, I was very happy to accept the invitation. The Council House was looking particularly fine as I headed towards the Museum on a peaceful Sunday morning. Birmingham City Centre has undergone a real transformation in recent years, and it’s definitely a perfect location for a city break. Birmingham Museum and Art Gallery is a few minutes walk from Birmingham’s main shopping centres in the Bullring and Grand Central. The main entrance to the museum is in Chamberlain Square, just around the corner from the Council House. Once inside, you walk up the impressive entrance pictured above and into the Museum. The museum’s permanent collections range from local history, the Staffordshire hoard of Anglo-Saxon gold, and a collection of Ancient Egyptian artefacts that is a popular school trip for many local children! Entrance to the museum’s main collections is free of charge, and it also hosts special exhibitions and events throughout the year. The museum also has a special mini-museum aimed at children, and it’s through this area that you find the entrance to the Edwardian tearooms. The Edwardian Tearooms is a beautiful airy space, with plenty of natural light. An eclectic mix of tables and seating give it a relaxed feel, and it’s the perfect place to refresh and revive yourself after walking around the museum. The Tearooms has a varied menu, starting with breakfast and brunch and continuing to lunch, afternoon tea and sharing boards. You can even buy vouchers for Afternoon Tea, which would make a lovely gift for a foodie friend. They can cater for vegetarian, vegan and gluten-free diets. And the Tearooms also run daily special offers, including the fabulous Sunday Lunch at £20 for two. I was invited to Sunday Lunch along with a number of Birmingham bloggers, including Ruth from RuthMillington.co.uk and Laura from Bite Your Brum. We started with a glass of wine while we waited for everyone to arrive. The Edwardian Tearooms serve a selection of alcoholic and non-alcoholic drinks. And they even have private booths with a ‘Press For Champagne’ service, in partnership with the House of Piper-Heidsieck. Each booth has its own Champagne buzzer, which will summon a server to guide you through the selection of Piper-Heidsieck Champagnes available. There’s nothing quite like a good Sunday Roast, and the Edwardian Tearooms certainly serve up a great roast. I had opted for the traditional Roast Beef rib. I hate it when beef is overcooked, but this was beautifully pink in the middle. The meat had been really well seasoned which made it even tastier, and mustard and horseradish sauce were available if required. Underneath the generous slice of beef lay roast potatoes and carrots, as well a selection of seasonal greens. These were perfectly cooked, without any hint of sogginess. And of course, there an amazing Yorkshire pudding perched on top of it all. It was possibly one of the largest I’ve ever seen, and was wonderfully crisp and light. Sous chef Tom Cruickshank is clearly a master of the Yorkshire pud! The other options on the Sunday Roast menu include this Roast Pork, with a sage and onion stuffing alongside. I’m pleased to report that the crackling both looked and sounded amazing! And there is a vegetarian option of this Wild Mushroom Wellington. This plate belonged to Emma from Emma Victoria Stokes, who kindly let me steal a forkful of the filling. It was full of flavour, and an excellent option for vegetarians or anyone who fancies a change from the meat options. And all of these were served with a red wine gravy, Emma’s Wild Mushroom Wellington came with a vegetarian gravy. Jugs of extra gravy soon appeared on our table, along with bowls of this gorgeous cauliflower cheese. It was really tasty, with tender cauliflower and a sharp cheese sauce. The options for dessert were regional icecream or Sticky Toffee Pudding. I didn’t take long to decide, because I absolutely love Sticky Toffee Pudding. And Tom Cruickshank’s pudding is light but still full of flavour, served with custard of course! 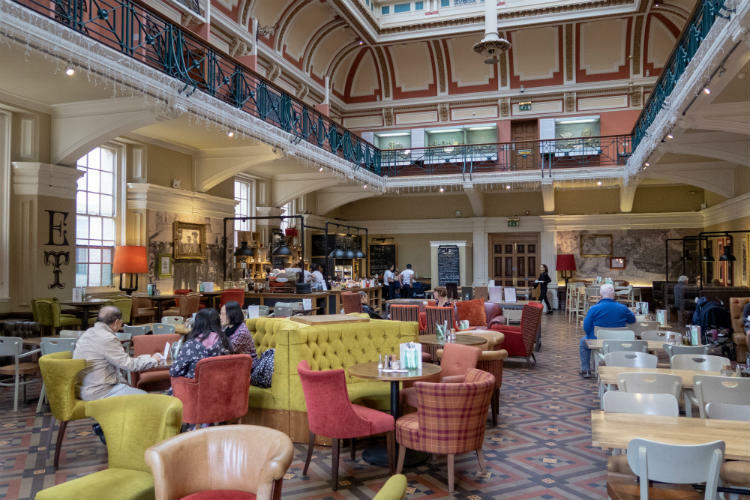 The Edwardian Tearooms in the Birmingham Museum and Art Gallery offer a fantastic, traditional Sunday Roast. By cooking good quality ingredients with care and attention, they deliver a seriously good meal. And at just £20 for two people, it’s seriously good value as well. This is the kind of Sunday lunch that makes you want to go home and have a good nap afterwards! Thank you to the Birmingham Museum & Art Gallery for inviting me to enjoy this delicious Sunday lunch in the Edwardian Tearooms.